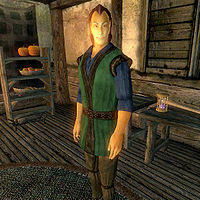 Ungarion is an Altmer enchanter and the owner of A Warlock's Luck in Bravil. Due to his class and his relationship with the local guild hall, Ungarion sells spells from nearly all the magical schools and also a variety of miscellaneous items, including the unique and enchanted Ring of Transmutation. Ungarion lives the typical life of a merchant, working long hours and having very little free time. He unlocks his store every morning at 8am and spends the next twelve hours offering his services to the population of Bravil. At 8pm, he closes up for the day and heads for Silverhome on the Water, where he will take his dinner for two hours. Afterwards, at 10pm, he will pay a late visit to the local Mages Guild Hall and hang out on the ground floor while chatting with his "colleagues" in the spell-casting business. At midnight, he goes home and finds his bed on the second floor above the store for eight hours of sleep. He wears a blue and green outfit and thick cowhide shoes. He carries the key to his store and a considerable amount of gold. Ungarion doesn't wield any weapons, choosing instead to rely on a set of low-medium spells from nearly all the magic schools. These are also the same spells you can buy off him. He will greet new customers by saying: "Take a chance on the Warlock's Luck! Heh-heh. Just kidding. Everything is all perfectly safe. Tested it myself. Ungarion, retired adventurer. You may have heard of me? ", which may not be the best way to put prospective buyers at their ease. When asked about Bravil, he will tell you that: "There are two ruined forts south of Bravil. One is close to the road to Leyawiin. The other is out on a point of land that projects into Niben Bay." This presumably refers to Fort Nomore and Fort Irony, although the former could be Fathis Aren's Tower. In any case, no markers are added to your map. It is not possible to invest in Ungarion's store, even after you have reached 75 skill in Mercantile.